It's the year for short stories in Canadian literature! Lynn Coady has won the 2013 Giller Prize for Hellgoing, a collection of short stories. Coady's short stories vary in style and setting but each presents characters in complex relationships. The Antagonist, her best-selling novel, was nominated for the Giller in 2011. Love the titles! Available in e-book. Going Home Again by Dennis Bock. According to the Giller Prize website, "with a poet's precision, Dennis Bock limns the inner landscape of a man in crisis." Hmm. Tragegy, lies and betrayal. You'll need wine for this book. Or maybe scotch. Cataract City by Craig Davidson. Did you know that Cataract City is a nickname for Niagara Falls, New York? Cataract City is about two brothers growing up in the gritty city. Craig Davidson is the author of The Fighter and Rust and Bone, both made into feature movies. Available in e-book. Caught by Lisa Moore. Author of the award-winning February (about the Halifax explosion), Lisa Moore's latest novel, Caught, is about a fugitive on the run across Canada in the 1970s. Plot-driven. Winner of the library website Who Should Win the Giller Prize? 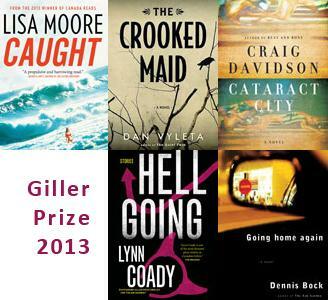 poll, but alas, not the actual Giller. Available in e-book. The Crooked Maid by Dan Vyleta. Set in Vienna after War World II, The Crooked Maid introduces a cast of characters recovering from the war. There's a murder in it! If you need help with e-books, contact the library and ask for Elisa.